My attention was captured by a news entitled “The only place where housing is easily affordable” when reading The Times, a UK paper recently. While I had expected some light on affordable housing solutions, I was surprised to find out that Copeland is the only area in England where house prices are less than three times the average annual salary of its residents. According to the same article that quoted a research by UK Trade Union Congress (TUC), the number of “easily affordable” local authority areas across England has fallen from 72 to just one over the last 16 years. In prime areas, house prices reach as high as 32 times the average earnings of their residents. Frances O’ Grady, the General Secretary of TUC which represents 6.2 million working people in the UK, called for an “ambitious programme” to bring the prices of homebuilding under control. This resonates with the earlier comments made by the governor of the Bank of England (BoE) Mark Carney who said in May that the only long-term way to effectively bring down home prices is to build more homes. 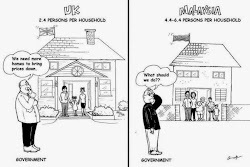 In the UK, 63.8 million people lived in 26.4 million homes in 2012. This works out to about 2.4 persons per house. There were calls for more homes even with such healthy ratio. Australia, which has a population of 21.5 million in 2013, has 9.1 million occupied houses or 2.4 persons per house. At the recent World Class Sustainable Cities 2014 Conference, Kerry Doss from Brisbane City Council showed a slide presentation of persons per household over the past century. As far back as 1927, Australia was already four persons per household. 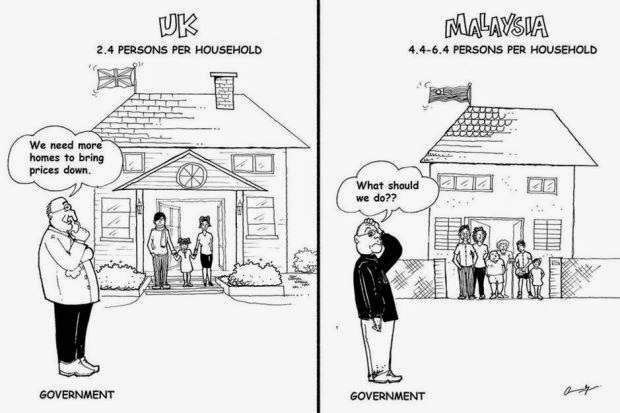 These made me reflect on the situation of our home country, especially since we too aspire to be a developed nation. According to National Property Information Centre (NAPIC), we have a total of 4.7 million homes in the fourth quarter of 2013. As NAPIC does not track rural homes, we assume that only urbanites were taken into account in the survey. his is a poorer ratio compared with Australia in 1927. This means we need to build four million to 7.8 million more houses to match the same ratio as the UK or Australia. While we are aware that the Government aims to build one million affordable homes over a five-year timeline since last year, we still have quite a fair bit to catch up. This is because we have only managed to build about 73,000 residential units per year for the last three years. Under Budget 2015, it is encouraging to note that the Government plans to build 80,000 units under PR1MA and 63,000 units under another housing programme. This will bring the total planned units to 143,000. This figure is still way too low and the Government should consider building at least 200,000 units a year to meet the vision of one million affordable homes. There should be a constant effort to track the progress of home-building. It is important to realise the goal of housing the nation by ensuring yearly targets are met. Some of the measures that the Government can consider were recommended in my earlier articles. They included freeing up state land for housing, purchasing agriculture land for development, building houses in rural areas and connecting them to the cities via public transports, as well as expediting the approval process to supply more houses to the market. In addition to supplying more affordable homes to bring down prices of homes, there are also other factors to ensure that the rakyat have a roof over their heads. In the same-mentioned article in The Times, Frances O’ Grady commented that, “Housing affordability isn’t just about house prices; decent wages are just as important.” I think it makes good sense and generates more food for thought for our nation. To bring the house price down, federation government just required to impose the law of every person only eligible 1 house irregardless of size and to upgrade your house to different location that you will have 1 year timeline to sell off your existing house upon certificate of fitness is obtained or else the property will confiscate under the law of residential entitlement.